Grain, water, yeast. Reading those ingredients, for many people, the first thing that pops into their heads is bread… And, indeed these are the foundation for baking bread. But, they are also the foundation ingredients for liquid bread, or, as we usually know it, beer. Making beer is an ancient skill. Wikipedia says that there is evidence of beer brewing 7000 years ago in what is today Iran, and documents a recipe for beer on a 3900 year old Sumerian tablet. Immigrants brought their brewing skills with them when they came to this country, and often the community brewhouse was one of the first buildings finished—along with the community oven for bread. So, beer has a long history of being important to humans. Beer brewing on the homestead was also an important skill. It added value to grain being grown and added variety to the family’s beverages. After all, on the frontier, no one was going to run to the local convenience store for a six pack. But, that was then. Why, with the wide variety of quality crafted brews available now, would anyone decide to go down the path of homebrewing? Well, for me, there is more than one reason. First, when I moved to South Central Kentucky in 1989, the selection of beers was relatively narrow. My taste was for dark amber ales and stouts, and there were few to choose from and they were expensive at most stores. While I could afford to indulge my tastes occasionally, it just wasn’t in my normal budget. The second reason is it is fun! It is almost like magic to take those simple ingredients of malt (grain), water, hops, and yeast, put them together, and watch the product happen. Once it starts fermenting, we can see the action of the yeast, and hear the sound of the fermentation lock “popping” from anywhere in the house. And, once fermentation is complete, we bottle it. It is wonderful to work together on filling and capping the bottles, knowing that in about 2 weeks, we will have another fabulous beer to drink and share with friends. The third reason, and maybe the most important one to us today, is control. We can control the ingredients that go into the bottle. We now purchase supplies from a co-op in California called Seven Bridges. They sell organic homebrew ingredients. We have been brewing beer from all organic ingredients for over 10 years. 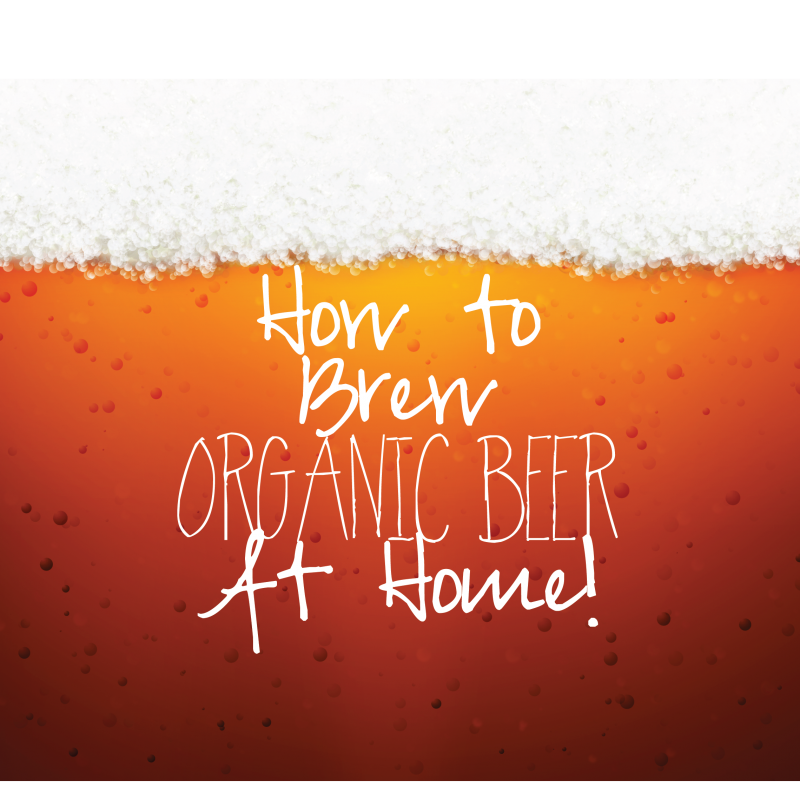 Since we are passionate about organic agriculture, being able to brew and drink organic beer is very satisfying. So, enough, or maybe too much of the history of homebrew. How does it work? We usually start with a kit. 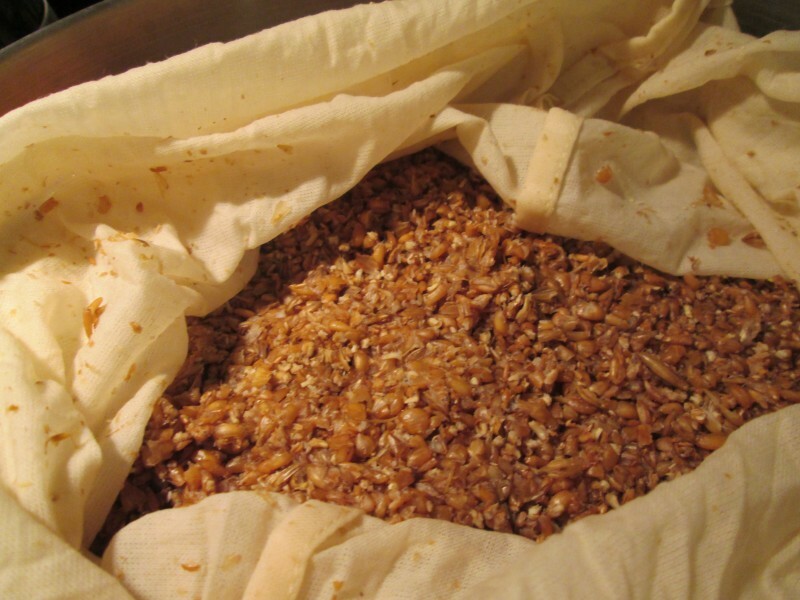 The kit will contain a variety of grains that have been malted. (If you are interested in the malting process, you read a good description online.) Basically, the process of malting grain allows it to start to germinate, dries it, and may also roast it for darker colors and different flavors. The germinating develops enzymes that help change the grain’s starches to sugars that will ferment. The kit may also have malt extract, a thick syrup made from malted grains—think molasses for texture. Additionally, it will contain hops and yeast. The fragrant liquid in the pot is now called wort. 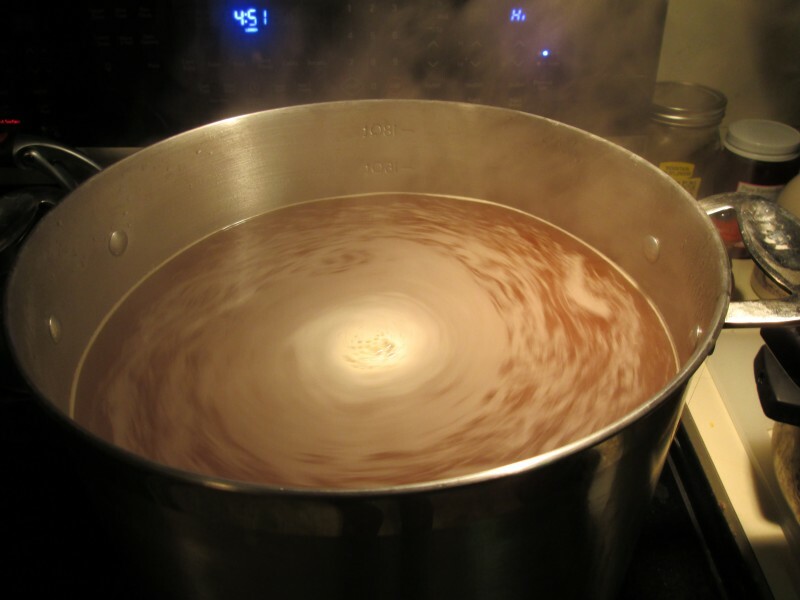 The wort is simmered for an hour, more or less, adding hops at intervals for bittering, flavor and aroma. What hops are used depends upon what type of beer being brewed. The latest beer we made, a Weissbier, had German Saphir and Tettnanger hops. After boiling, we cool the wort using a wort chiller, but for years, we just waited for it to cool naturally. If it is too hot, it will kill the yeast, so be patient. We aim for somewhere between 75 and 80 degrees. We put the wort and enough water to make 5 gallons into a 6 gallon glass carboy, “pitch” the yeast, and put a fermentation lock in the top of the carboy. This is a project for a leisurely afternoon. A lot of the time is wait time, again like making bread, but it will take at least a couple or three hours—more if a wort chiller isn’t used. We view it as a recreational activity and read, talk, and often have a chilled homebrew in between tasks. Fermentation will be vigorous within 4-6 hours and last about two weeks. Toward the end of the time, the beer will start to clear and have a definite layer of sediment in the bottom. Time to bottle! At this point, the beer is drinkable, but flat. To get the carbonation we all expect in beer, we prime it, although there are other ways. To do that, we add more malt extract to our bottling bucket (a 6 gallon food-grade plastic bucket). This will provide the sugar to “prime” the yeast to start fermenting again. But because it is now doing that in an enclosed space—the capped bottle—the carbon dioxide can’t escape and is absorbed into the beer. Voila! Carbonation! Then, using plastic tubing, we siphon the fermented beer into the bottling bucket from the carboy, being careful to avoid siphoning the sediment at the bottom. Following that, we set up counter space for bottling. Using plastic tubing for siphoning and a bottle filler attachment, I fill the bottles and hand them to Paul, who caps them, marks the cap with a batch number and puts into a case. It takes maybe 1.5 hours including cleanup. Now, just wait a couple of weeks for the carbonation. Chill a bottle; pour into a glass and taste. Notice there is some sediment in the bottom of the bottle. If you pour carefully, the neck of the bottle will catch that so you don’t pour it into the glass. If the homebrew is still a little flat, wait one more week. It should be fine by then. And, especially with darker, bolder beers, the flavor will continue to improve for several months. 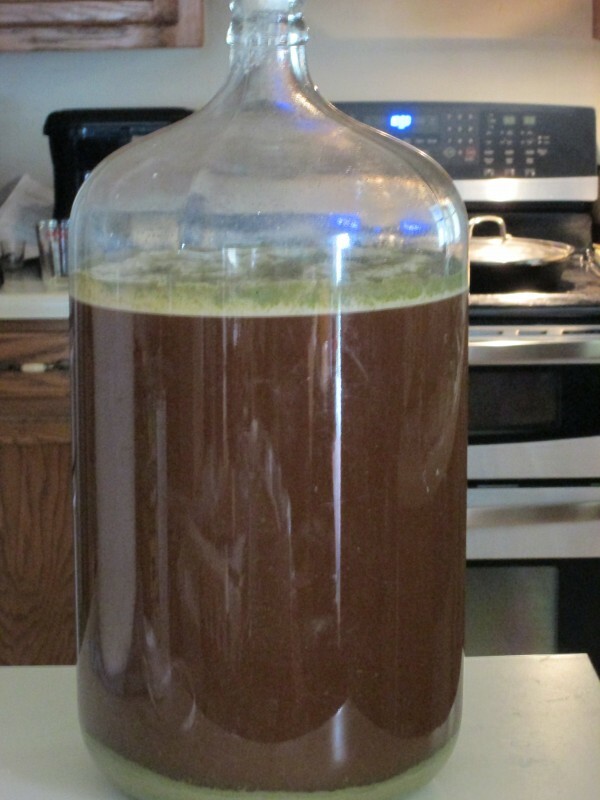 I have just touched on the process of making homebrew. I would suggest reading The New Complete Joy of Home Brewing by Charlie Papazian. It is very entertaining and contains lots of great information and recipes. If you decide brewing might be for you, check if there is a homebrew group or an experienced homebrewer in your community. I learned from a book, but learning from people is more fun and you’ll make fewer newbie mistakes. When you decide to try brewing, buy quality supplies from a homebrew store. Most larger cities have them. The carboys and such last a lifetime and you’ll be happier in the long run with your investment. Purchase the essentials and add the nice-to-haves, like a wort chiller, a little at a time. Most important, have fun! It is a really enjoyable skill to acquire, and the beer is fabulous! Soon you will be inviting all your friends to come over and have a homebrew. Do you all know of any growers in KY the produce ingredients for beer?